Click to listen to episode (2:27). From the Cumberland Gap to the Atlantic Ocean, this is Virginia Water Radio for the week of July 1, 2013. This week, in honor of the upcoming Independence Day holiday, we travel back in time to a public gathering house where evening diners were passing along the water news of the American Revolutionary War. Sound like historical fiction? Well, just have a listen for about 25 seconds. You’ve been listening to the names of 11 water bodies where important events took place during the American Revolution and war for independence from Great Britain, fought between 1775 and 1783. These water bodies and many other rivers, creeks, and coastal areas were battle sites, important harbors, strategic transportation routes, gateways to cities, or obstacles to the movement of troops or supplies. Virginia is the location for a few key sites, the most famous being the York River and Yorktown, where the large army under British General Cornwallis surrendered in October 1781, essentially ending the war. And Virginian soldiers played leading roles on many of the waters of the Revolutionary War, from George Washington’s famous crossing of the Delaware River to the water-logged march of soldiers under Albemarle County native George Rogers Clark to capture Fort Sackville, way down along the Wabash River in present-day Indiana. “The Wabash—Through Wilderness and Flood,” a mural by Ezra Winter on display at the George Rogers Clark National Historical Park in Vincennes, Indiana. Image accessed at the National Park Service’s Web site, http://www.nps.gov/gero/historyculture/wabash.htm, 7/1/13. Acknowledgments: Thanks to neighbors in Blacksburg, Virginia, for their June 30, 2013, recordings of names of water bodies involved in the Revolutionary War. The water bodies mentioned are as follows: New York Harbor, Boston Harbor, Charleston Harbor, Brandywine Creek, Delaware River, Hudson River, Lake Champlain, St. Lawrence River, Wabash River, and York River. 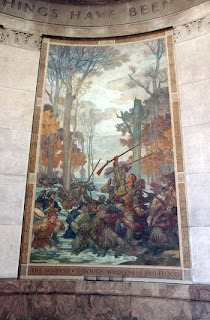 Information on the life of George Rogers Clark, from the Web site of the Indiana Historical Bureau, “George Rogers Clark Biography, http://www.in.gov/history/2958.htm. List of parks related to the American Revolution or colonial America, from the National Park Service, online at http://www.nps.gov/revwar/contact/park_info.html. List of Revolutionary War battles compiled by Joseph Logan, “The American Revolution” Web site, at http://www.theamericanrevolution.org/battles.aspx. Timelines of the American Revolution from the National Park Service, online at http://www.nps.gov/revwar/about_the_revolution/timeline_of_events_06_10.html; and from the Independence Hall Association of Philadelphia, online at http://www.ushistory.org/declaration/revwartimeline.htm. For a previous Virginia Water Radio episode on the role of the York River in the battle of Yorktown, please see “History on the York River—‘The Surrender of Cornwallis’ by Bobby Horton (Episode 103, 3-19-12, 2 minutes/51 seconds), at http://www.virginiawaterradio.org/2012/03/episode-103-march-19-2012-history-on.html.